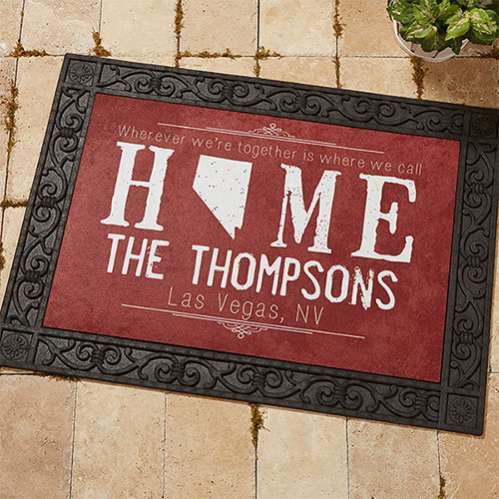 A custom doormat is the perfect home accent piece that your friends and family can enjoy all year long. You can further customize your doormat by choosing one of four muted colors that will match any home décor. Optionally, you can add a decorative black rubber tray that will frame your custom doormat keeping it securely in place. The rubber tray also adds an embellished border to the custom mat making it really stand out, no matter where or how it is used. And that’s another great thing about custom doormats—because they’re personalized they have so many great uses! Sure, you can place it in front of your door to welcome guests, but you can also use it indoors in your foyer or hallway, which is especially nice during winter when messy boots get brought inside. Actually, any door that leads to the inside of your home deserves a doormat, including your garage door, back door, patio door or even the door going down to the basement. A custom doormat can also look nice in front of a fireplace or in the kitchen in front of the sink or stove. The “State of Love” personalized doormat comes in two standard sizes that fit most doors, but there’s also an oversized option that works especially well indoors because the door mat resembles a custom rug. Sturdy polyester material and quality construction, including non-skid rubber backing. State of the art dye-print technology and 4 background color options. Personalized with any U.S. state and 3 lines of custom text. Choose from 18×27, 20×35 or oversized 24×48 sizes. If you’re looking for a unique Christmas gift or want to spruce up your home décor for the holidays, consider a custom doormat that can be used year-round, both indoors and outdoors. I love this! I would gift to my mother in law. She needs something cute! So personal!